UseMyWallet is very similar to Quicktender except it is only open to users from the US and Canada. 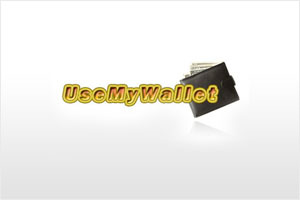 UseMyWallet is an invite only service but an invite can be obtained fairly easily if you are already a member of an online casino that uses UseMyWallet. Simply send an email to the casino’s customer services requesting an invitation to set up an account on UseMyWallet and they should send it with little or no fuss. The invite will allow you to register an account at UseMyWallet. Registration is free. Once registered, an account holder needs to put money in the account and this can be done via bank transfer or credit card deposit. Depositing money using a credit card incurs a 5% service charge fee whilst transferring money from a bank is usually free. However, much like Quicktender, this depends upon any third party charges which may be required to process the money from the bank to UseMyWallet. All transfers to merchants are instant. With funds deposited into the UseMyWallet account, a user can transfer these into an online casino account for free. This is done by accessing the cashier section of the casino website and selecting the Quicktender payment option to deposit funds. There is no yearly subscription fee involved with UseMyWallet and the only other cost is to withdraw money from the account to a bank. This is a $30 flat charge, regardless of how much money the user wants to withdraw from the UseMyWallet account. The process usually takes a few days. The benefit to being invite only and a service only available in North America is that UseMyWallet can focus more on security and with a 128bit SSL encryption, account holders can be certain that their money is safe.